Elbow above or at shoulder level? On this board i think i have seen mixed feelings on this. When you pitch do you want your elow at shoulder level or do you want your elbow above shoulder level. Which do you think alows for more velocity and helps keep you injury free!? You are wrong Booma. It is possible to have the elbow below the level of the shoulders with an overhand release. 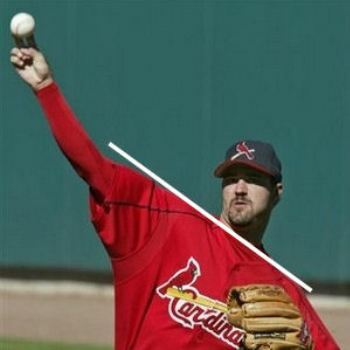 It is true that the throwing elbow is above the throwing shoulder relative to the ground. I think the confusion is in the wording of the statement. I knew that you meant also. Just the wording can be very confusing. Most pitchers throw high 3/4 anyway, very few actually throw straight over the top at 12 o’clock. Nomo, Lincecum, Santana, Clemens (when he was younger), and Koufax, to name a few. If any pitcher is going to use an overhand release point, they should understand that it’s not about “getting the elbow up”. It’s about shoulder tilt, which is controlled by the muscles of the torso. Don’t use the muscles in your arm to “raise” your arm slot. Another thing with the overhand slot you will notice is that some pitchers have a slight lean backwards before their front foot plants.